This card is no longer part of the Positano.com collection. 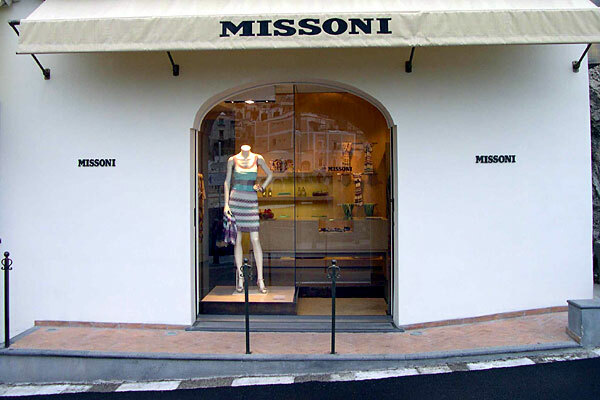 Missoni, one of the most famous names to be certified authentic "made in Italy", and one of the few to be able to boast 50 years in the fashion business, has opened a new boutique in Positano, just a few meters beneath the Hotel Le Sirenuse, in the enchanting setting of the Amalfi Coast. Missoni is experiencing a phase of astounding growth, product of the new vitality brought to the company by Vittorio, Angela, and Luca: children of founders Ottavio and Rosita. Missoni and its fashion collections have revolutionised the world of knitwear thanks to their innovative creations, realised with quite inimitable techniques. The quality of each and every item labelled Missoni, is the result of the painstaking craftsmanship of the Italian artisans/artists who work the much envied Missoni looms in the workshop/ studios of Sumirago, studios known for the immense windows overlooking the wood owned by the Monte Rosa family.